Richer Picture's INDIVIDUAL LEARNING PLANS platform helps your school provide multiple opportunities to your students for college and career readiness. Personalized with Student Voice: Students can earn badges that align with their personal interests and with their academic, career and personal goals. Customized for Your School: Each component of the ILP can be customized for your school. Richer Picture's Course Planner lets students create a 4-year plan based on the specific course offerings - and the specific pathways - that you offer. Each area - Academic, Career / College, and Personal / Social - contains Explorations for student activities. You can easily customize the list of explorations for each grade. Lesson Plans: Richer Picture includes 20-30 lesson plans for each grade level (6-12). Each lesson plan is designed for a 20-30 minute advisory period and can be adapted by your teachers. 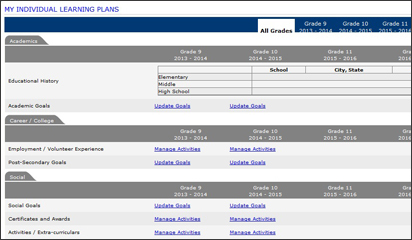 Reports: Administrators, advisors and counselors can generate reports, showing student progress. Reports can be organized by grade, by advisory and by guidance counselor caseload.